Bob Stanley's new book, "Yeah! Yeah! Yeah! : The Story of Pop Music from Bill Haley to Beyonce," like the song it takes its title from, is an exuberant celebration of the silly and the sublime. Stanley, a British music journalist and co-founder of the pop group Saint Etienne, loves pop and has a deep, knowing respect for it. His book is comprehensive - some 600 pages - yet nimble. He is pro-joy and anti-snobbery, his writing delights and surprises, and his description of the music makes you want to dance to it. 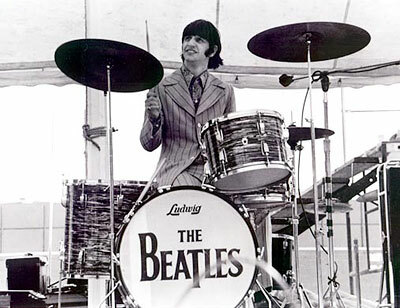 Not many mention Ringo Starr as one of the all-time great drummers. Certainly he wasn't showy like Keith Moon or John Bonham, but maybe fits in better with the style of Charlie Watts of the Rolling Stones. Click here to see what fellow drummers have to say about Ringo! Interesting article - I have three of these albums and vaguely recall two others, but I will have to explore the rest. I remember Fanny and still have one of their albums. Richard Goldstein was one of the first rock music critics to emerge in the 1960's. Writing for the Village Voice from 1966 to 1968 allowed him to meet most of the major rock stars of the time. Great photos from a Life Magazine profile of rock stars posing at home with their parents in 1971. Includes Frank Zappa, Elton John, Grace Slick, David Crosby, Joe Cocker, Richie Havens, Eric Clapton, Donovan, Ginger Baker and the Jackson Five. Comments from the Life Magazine Photographer here. In light of the upcoming release of "Montage of Heck" a book and documentary film about Kurt Cobain, UK author Matt Haig (Reasons to Stay Alive) takes on the myth of the tortured genius. The young Kurt Cobain in scene from "Montage of Heck"
Judging from the movie trailer the film makers have done a great job capturing the era and of course the rise and fall of Brian Wilson and the Beach Boys is one of rock music's most interesting stories. First came the great book from Kent Hartman and now a new documentary film on the collection of Los Angeles based studio musicians nicknamed "The Wrecking Crew" who played on hits by The Byrds, The Beach Boys, The Ronettes and many others. I enjoyed the book for it's behind the scenes look at how numerous well known sixties hits were created and I'm sure the film will be worth a look too.